When it comes to weather, the Northeast US has seen it all this past winter: sub-freezing cold and heavy snow, interspersed with warm dry conditions up to 60°, heavy rainfall, powerful winds, and returning snow storms pounding the region. 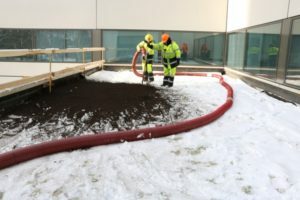 With conditions varying quite a bit from week to week, even trees and power lines being felled in high winds, what can we expect from the green roofs high above ground level, invisible to many, quietly doing their job keeping rainfall on-site, among other important environmental functions. Fig. 2 High performing extensive system. Many question how a vegetated roof can survive winter and how it will perform in the Spring. Some people question how the vegetation looks. Does the bitter cold, wind and snow damage the plants? Will the green roof die? Can it be walked on in winter months for necessary rooftop maintenance? Does vegetation need to be re-seeded in the Spring? Important questions, to which solutions start at the design phase. Vegetated or green roofs, whether intensive or extensive, experience the same cycles of growth, flowering and dormancy that occur to plants on the ground level. Vegetated roofs that are properly designed for climates with four seasons, correctly installed and routinely maintained, have a greater probability of survival no matter the season, and the changing conditions. This article will focus on lightweight, extensive vegetated roofs, as this is the prevalent type of vegetated system in the Northeast US and across North America. 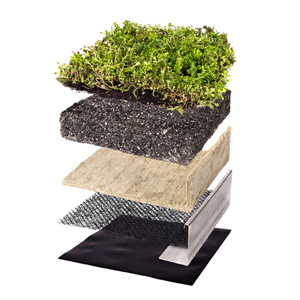 Extensive roofs use shallower depth of engineered growing media up to 6 inches and are lighter than intensive vegetated systems. Growing medium may be the traditional soil-based or a lightweight needled mineral wool made solely of virgin rock mineral fibres, or a combination of both for best water-retention-to-weight-ratio (see Fig 2). Extensive roofs can achieve excellent water retention and are more economical to install and maintain. In cold Northern climates such as the Northeast US, vegetated roofs start going into dormancy in the Fall to prepare for winter. As rooftop conditions are harsher than at the ground level, the exposed vegetation on rooftops enter into the dormancy cycle earlier than at ground level. Dormancy is a natural reaction to adverse environmental conditions. It is the plant’s defence mechanism to keep itself alive stopping further growth and conserving energy. It occurs each Fall in preparation for the cold winter. It may also happen in the summer during periods of intense heat and drought, if not irrigated. Dormancy synchronizes with the environment and can be triggered by a temperature drop or sudden changes in climactic conditions, such as water shortage. Retreating plants are not dead. 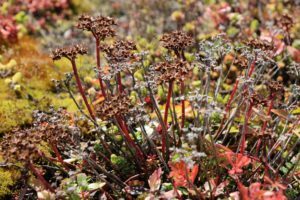 Green roofs lose their flowers and change colour in dormancy creating a beautiful landscape of reds, bronze and browns, to deep purples. Coniferus sedum plants retreat to form a dense mat of glossy and fleshy leaves, while the leaves of deciduous sedum species completely fall off. For highest probability of survival, a vigorous, low-growing, drought tolerant plant species such as sedums and mosses is the ideal choice. These plants are tough and reliable and can withstand harsh rooftop conditions year-round. Sedums are succulent plants that mostly originate in Northern climates and flourish in harsh conditions. Vegetation that is pre-grown outdoors locally, for several months or over a winter, ensures they are acclimatized to the localclimatic conditions. Mature vegetation, with excellent foliar coverage (85% and higher), not only offers instant green upon installation but a higher probability of survival with less chance of wind and soil erosion. The needled mineral hydro blanket’s high water retention reduces the need for irrigation and improves plant survivability year round. Snow accumulation is welcome as it insulates the vegetation. A blanket of snow shelters the vegetated roof from strong winds and helps the plants retain moisture and the blanket of vegetation shelters the growing medium from wind erosion. In colder plant hardiness zones, or in areas where there are extreme fluctuations in temperature, green roofs require a deeper depth of growing medium to help mitigate the effects of intense temperature and moisture changes. Additional growing medium acts as a thermal mass helping moderate the temperature and hydrate the plants – helping reduce significant die-back in the winter or during hot summer droughts. Water retention materials such as the needled mineral hydro blanket is used to supplement and replace traditional soil-based growing medium and achieves equal or better water storage capacity while keeping the system weight low. such test standard in the world, it is now possible to ensure you choose the right vegetated system for a specific building or certain elevation. If there is little or no snow accumulation, and the vegetated roof is subject to high winds, extreme fluctuations in temperature or a particularly severe ice storm, plant desiccation, or “winter burn” can occur where the plant dries out and dies. This may expose areas of growing medium that may be subjected to erosion by high winds. If such damage occurs to the vegetated roof, a straightforward procedure for repair can be followed in the Spring. This repair procedure also applies to other vegetated roof repairs due to excessive foot traffic or due to construction materials left on the plants for extended periods of time. The repair is done in the Spring using a variety of sedum clippings sprinkled, where needed, to replace the sections that have been damaged or eroded. Succulent plants such as sedums are easy to propagate. Many can be rooted from a single leaf, others will root quickly from a stem cutting. For areas that suffered erosion, additional engineered growing medium should be added, as required. After the initial planting of clippings, frequent, light irrigation is required to keep the vegetated roof moist and help ensure the plants take root. Johnson & Johnson World HQ, New Brunswick, NJ installation in December 2017. Pre-vegetated sedum mats delivered to J&J site have almost 100% coverage with mature vegetation. Many vegetated roofs are installed in the Fall due to the construction schedule and desire to finish the project. In such cases, it is critical to have mature and well established plants as they have greater survivability on rooftops than plants that are immature seedlings. The vegetation may have been disturbed during harvest, transport and installation. Therefore, after installation, it is important to keep the vegetated system hydrated during the establishment period for the plants to recover and take root and prepare for the coming winter. It is imperative to have water access on the rooftop. Furthermore, good design ensures pavers or ballast is installed to reduce foot traffic and vegetation damage. 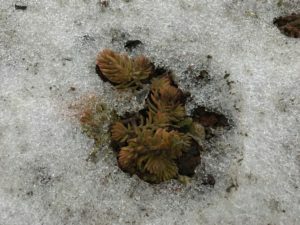 In cold climates, particularly when temperatures drop below freezing, foot traffic over vegetation must be avoided as it can prove lethal, leaving foot-shaped patches of dead plants. The damage will be obvious the following Spring and recovery may take several months or may not happen at all. If pedestrian traffic is unavoidable, protective measures must be taken to diminish the impact of damage. 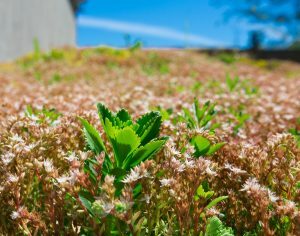 Materials like plywood sheets or insulation boards may be laid over the vegetation temporarily to help distribute the weight on the green roof, and removed at the end of each day to allow plants to recover. Year-round maintenance is key to ensuring long-term survivability as well as the stormwater performance of the vegetated roofs. One last maintenance check should be done in the Fall as part of the yearly routine. 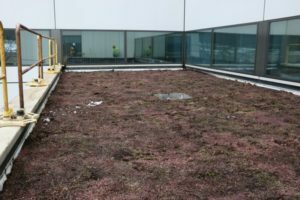 Vegetated roofs are also known for their ability to protect the roof membrane, however, not taking proper preventative measures can also lead to unforeseen problems. Fall maintenance includes the removal of debris and inspection of all drainage paths. In Fall, it is best to remove fallen leaves and twigs from the green roof. Thick layers of leaves and twigs can also stick together to form an impenetrable mat and may lock in too much moisture, potentially causing rot or damage to the plants. Weed, one last time, before winter sets in. Make every effort to capture the seed pod intact and tuck it away for disposal to avoid seeds blowing away. 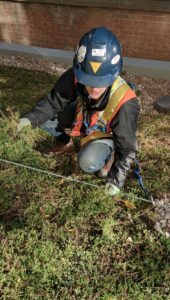 Some weeds may be tolerated, therefore maintenance personnel should be familiar with green roof plants and the owner’s green roof aesthetic preference. Keeping the vegetated roof hydrated into the Fall months helps the vegetation avoid winter’s freeze-drying effect caused by low temperatures and high winds. If there is an irrigation system, it needs to be winterized around October in nothern States as frost typically sets in soon after. Maintenance crews typically use an air compressor to blow out the water from the irrigation system. Vegetated roofs should not be fertilized past August, especially with a slow release type fertilizer. Fertilization may stimulate tender growth and compromise the hardiness of the plant. Secondly, plants won’t have a chance to fully take up the nutrients and the combination of high temperatures may cause the plants to burn. Slow release fertilizer is usually applied once, ideally in the Spring. 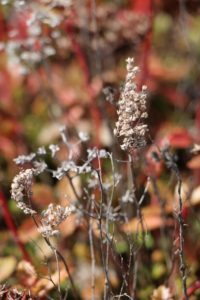 Assess the performance of the green roof in the Fall and prepare for next Spring. It is a good idea to document your visit with photos and record recent weather conditions for future reference and any potential warranty claims.